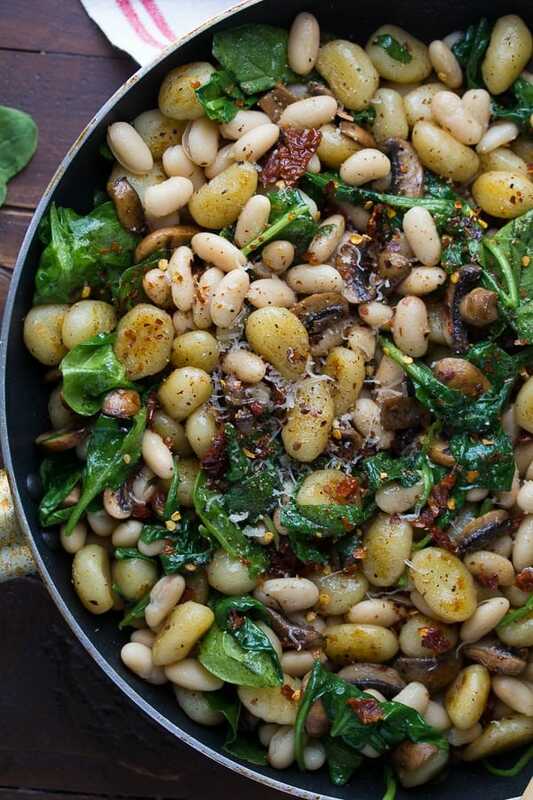 A healthy vegetarian recipe for one pan gnocchi with sundried tomatoes, white beans, spinach and mushrooms! Ready in 30 minutes. Aaaahhh! It’s October 1st! Is that crazy or what?! October in my mind is crazy town…My brother’s wedding, Kai’s 2nd birthday, Ben’s-not-2nd- birthday (I’ll leave it at that 😉 ). So basically I am going to need some easy recipes up my sleeve for October. And today I have one seriously easy recipe for us: one pan gnocchi! Have you ever eaten pan-fried gnocchi? It is ALL SORTS of wonderful. I first saw Nigella do it, and then had to try it for myself. Here’s the deal: packaged gnocchi, some olive oil, salt and pepper and a hot pan. Cook until golden. They get crispy on the outside and soft on the inside. So wonderful! I took this idea and added a few ingredients to turn this one pan gnocchi into a full meal: white beans for some protein, spinach and mushrooms for some nutritional content, and sundried tomatoes to boost the flavor. In addition to the sundried tomatoes, I added a sprinkling of red pepper flakes for a touch of heat. 1/2 teaspoon is just enough for me, feel free to add more or less to taste! And cheese. Of course. Can’t forget the Parmesan cheese. A nice shower of it just before serving. Easy peasy, healthy, vegetarian, made with a bunch of pantry staples, and ready in 30 minutes. And only one pan. October, bring it on. I am ready for you! Heat oil in a medium pan over medium heat. Add the gnocchi and separate them. Sprinkle with salt and pepper and red pepper flakes, and cook, stirring occasionally for 8-10 minutes, or until golden and slightly crispy. Add the mushrooms, and cook for 3 or so minutes until soft (add additional olive oil if needed). Return the gnocchi to the pan and add the sundried tomatoes, spinach and white beans. Stir until spinach is wilted and everything is heated through. Add additional salt, pepper and red pepper flakes to taste. Makes a great lunch the next day. This works well with packaged gnocchi (sold with the dried pasta in the grocery store), but hasn't been tested with fresh gnocchi. 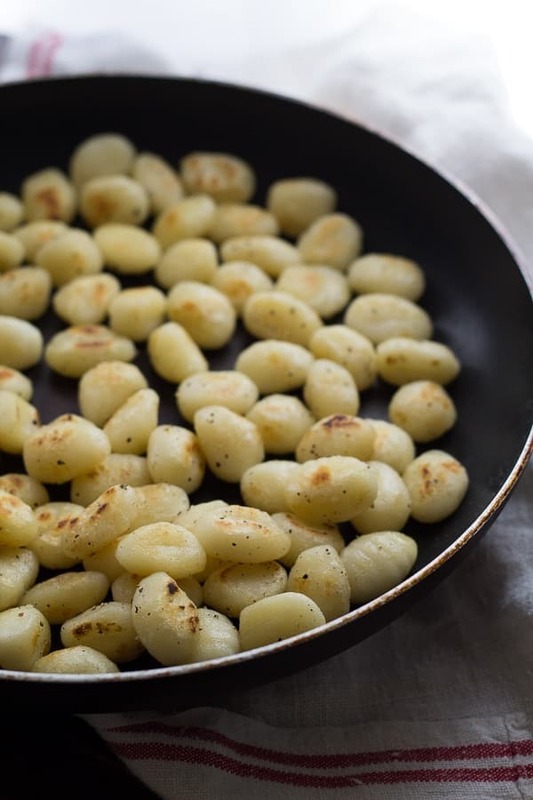 **I do need to note that in adding the extra ingredients to the pan-fried gnocchi, the gnocchi does lose a touch of its crispiness, but it still retains a really nice texture. Hazelnut Chicken One Pot Pasta by Bake. Eat. Repeat. I made this tonight and it was excellent! I added a piece of oven baked sausage and some garlic. I used oil packed sun dried tomatoes because that is what I had. This recipe will definitely become one of my regulars. The gnocchi cooked that way was great. Tastes delicious! Made this with a vegan sausage substitute (Trader Joe) for mushrooms. Super yummy, however,quite dry! Any suggestions as to a sauce we could add to help provide some liquid? Hi there! I made this with homemade gnocchi and I am raving over the texture that you get with the light browning. You’ve changed my gnocchi game forever! It had never occurred to me to serve gnocchi like this (i.e. not just a sauce) and it was very tasty. Hi Stephanie! I bet that would work well! Make sure to squeeze out extra liquids before adding. Thank you. I made it tonight – delicious. I added a little garlic. Glad you enjoyed, April! Thanks so much for taking the time to leave a review! I dont think parmesan cheese is vegetarian, Am I wrong? What’s another vegetarian option I can use? Parmesan cheese is vegetarian but not vegan. It tastes great without any cheese, if you are looking for dairy free. Hi Linh! I think you’re right, there is something about rennet being in parmesan and it not being actually vegetarian (I was shocked to read this!). You can swap with any cheese or just leave it out. I bet feta cheese would be good! Hi Kristina! I have only tried with the shelf-stable gnocchi, not fresh, however I do know others have tried fresh. Either way, you don’t need to boil for this recipe. Hope you enjoy! Love this recipe! W’ve been enjoying it for years. We’re vegetarians and love finding delicious recipes such as this. I recently made it with musroom gnocchi and it was wonderful. This is so yum! I made it with peppers and onions instead of mushrooms (they spoiled) and it might have been even better. Are the sundried tomatoes you use in this recipe dried or in oil? How many servings are in this recipe? The nutrition info doesn’t say so I don’t know how many calories are in each serving. Hi Erica, sorry about that! I just transferred recipe card plug-ins and it seems to have removed some of the serving sizes, I will update ASAP. It’s for 1/4 of the batch. I’m such a fan of all the recipe items in this dish, so cooking them together will be wonderful. I always feel that good cooks are like good artists and know the “beauty” and flavorful tastes of their blended dishes. Thank you for such inspiration. I was wondering if you would consider adding your website name to your printed recipes, like right below the title or something. I really like having the reference so I can easily come back to your site for more things to cook! Regards for your work! PS It wouldn’t let me leave 5 stars, so I’ll send you one extra. This is one of my favorite recipes! As someone said earlier, I can eat all of this and not want to share. ? Thanks for the recipe. I’ve made it several times now. It gets better every time. Oh my gosh, so delicious and so quick!!! Thank you! Do you think this could be frozen and reheated? This recipe is awesome. Added zucchini & squash the second time I made it! Thank you! It’s not vegetarian if it has Parmesan cheese on it. Just made this and it was really good! I added a little bit of garlic with my mushrooms as well! I used fresh gnocchi and it still worked, so that question is answered! So easy to make! Didn’t even take me 20min. I will def make this again! Thanks for reporting back, Marie! That’s interesting about the fresh gnocchi…now I really want to try it! Made the gnocchi yesterday and everyone loved it. I cooked them first because I didn’t know if they would be tender enough if I didn’t. First time I made gnocchi it was a disaster but this time with your recipe it was delicious. Hi! What kind of white beans did you use? I don’t use a lot of beans in my cooking, so I got both from the store. Hi Karen! I have used navy, cannellini and white kidney beans…I’m not sure if these are all names for the same beans or not, but they all taste pretty similar to me 🙂 I hope you enjoy the recipe! This has become one of my favorite recipes, I make it once every other week. Thank you!!! I’m making this for the second time. It was great the first, but I did add minced garlic to the mushrooms and omitted the beans. Thanks for a great recipe!! Hi Melanie! Thanks for reporting back…love your additions/substitutions. It is better to use oil-packed sun-dried tomatoes, or the dry ones? Hi Jenny! I’ve never actually used the dry ones before. I used the oil packed ones (but drained and rinsed). Hope you like it! This looks really tasty Denise, but I would love to see the sodium breakdown. Where does all the sodium come from if you rinse the beans? That is half my sodium intake for the day! Thanks! Hi Laura, I will have to go back to My Fitness Pal and put it back through to find out exactly where the sodium comes from but I’m guessing it’s the sundried tomatoes. You could leave them out if you’re worried about sodium! So you don’t boil the gnocchi first? I made this tonight for supper and I saw it was turning out dry at the end so I added about 3/4 cup heavy cream and simmered it for a few moments. The starch in the gnocchi thickened the cream and it was amazing. It really only took half an hour to make. While the gnocchi were pan frying I sliced the mushrooms and diced the sun dried tomatoes. My daughter can’t have mushrooms, any ideas on a good substitute? Thanks! Hi Cristen! You could sub any number of veggies for the mushrooms; I bet bell peppers or asparagus would be great! Made for dinner tonight.. Delicious! I have been cooking gnocci all wrong! This is the way! What a compliment! I agree with you though, as soon as I learned that technique for the gnocchi there was no turning back. Thanks Amber! Made this for dinner last week and loved it! Blogged about it (linked back to your website and the actual recipe on your site) and will be sharing post tomorrow. It was our first Meatless Monday and we had this for dinner! The whole family loved it! So good. I made this tonight for the family. Omitted the red pepper flakes, but and added some diced garlic, plus some garlic powder after the fact. 3 out of 4 of us had 2 bowls. My youngest wasn’t a fan of the gnocchi texture (our first time ever having it), so she had a pb sandwich lol. I loved it though!!! We added fresh diced tomatoes on top after it cooked. YUM! I can’t wait to eat the leftovers 🙂 Thanks for making our “Meatless Monday” so delicious and filling! Hi Leslie! I’m so glad you and (most of) your family liked it 🙂 Thanks so much for reporting back! HAHA!! I had to read your comment three times. Too funny! Glad you liked it. Made this for dinner tonight. The husband and I liked it very much. The boy who eats everything just made yum noises. The teenager, well, she hates everything right now. We give it 2 thumbs up and definitely a keeper! Thanks! Made this tonight and I agree, it was a bit dry. I used fresh gnocchi, which was great, but I, too, thought it needed some chicken stock and/or wine to enhance it and cut the dryness a bit. Great flavor combinations though, and will try it again with a bit of stock. 🙂 Loved the pan-fried texture of the gnocchi! Hi Amanda, thanks for your comments! I chose to keep it without a sauce because I just can’t get enough of the crispy gnocchi texture 🙂 But I’m sure some stock wouldn’t hurt at all. Tried this with fresh gnocchi! Delish! Thanks for the recipe. It’s a keeper! Hi Mariah, I’m so glad you liked it! Good to know that it works with fresh gnocchi as well. Thanks for reporting back! this looks great! I’ve never cooked gnocchi before and I just bought a refrigerated package of them…do I need to boil them before pan frying? Or do I just pop them in a pan? Hi Erin! For this recipe, I didn’t cook the gnocchi first, just browned them in the pan, however I was using packaged gnocchi, and I assume you have fresh gnocchi since it’s refrigerated? I just did a little digging and this blog says fresh or packaged gnocchi worked for her for the same type of recipe? I’d love to hear how it goes for you! I love gnocchi! And I also love quick meals, so this is calling my name big time! Life got so busy here recently so I need to add these to our menu. Yum! Busy life is HARD! I am all about the shortcuts these days. Thanks so much, Alyssa! Oh my this dish looks amazing! I’ve only ever cooked gnocchi once and it was just ok. But this dish and those pan fried gnocchi’s look so yummy! Love all that protein too. Pinned! Ps I can not believe it’s October either. Time needs to stop already! I hear ya, Cyndi! I find the boiled gnocchi is so blah. (Unless it’s handmade!!) The pan-fried stuff is so good though, I hope you try it! Oh gosh, I am sort of freaking out that it’s October. This fall is going to be completely nuts and on top of that it’s flying by!! This gnocchi sounds awesome! I’ve never pan fried mine before … must try that!! You sure do have a lot going on this month, Denise! I hope the thesis writing doesn’t make you too crazy! 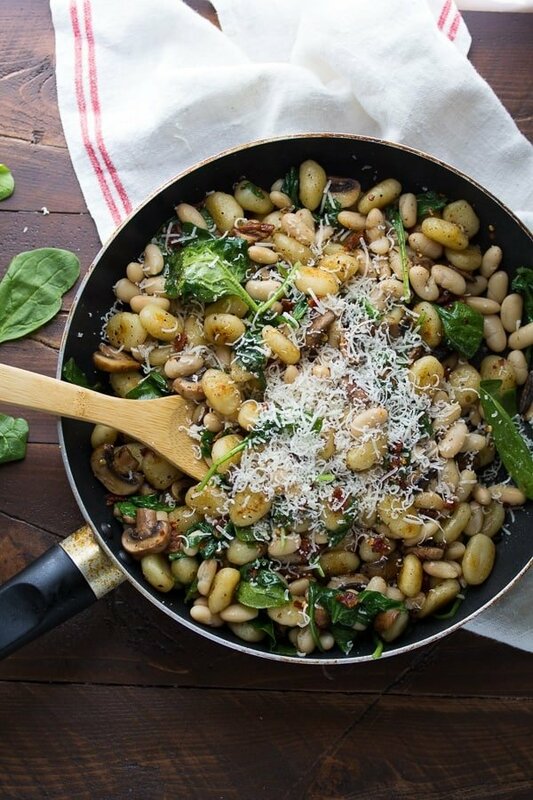 😉 I never would have thought to call gnocchi beautiful, but this sure is one gorgeous one pot meal. Love it! Aw thanks, Kristine! I know I can get it all done, but I’m just not good at the thinking about it all part, if that makes any sense 😉 I sure will be glad when 2016 rolls around! Good luck with your thesis. October is a crazy month of birthdays for our family too so easy one pot meals are always my favorite! Love all the veggies in this pan fried gnocchi! It looks so amazing! Why is October crazy birthday month for everyone? I love birthdays but I will secretly be happy when it’s all over and done with 😉 THanks, Kelly! October sounds like a really happening month for you! And this gnocchi with sun-dried tomatoes and beans look incredible, Denise. So gorgeous! Oh yes…busy busy busy 🙂 Thanks so much, Anu! October is also going to be crazy town USA for me too!!! 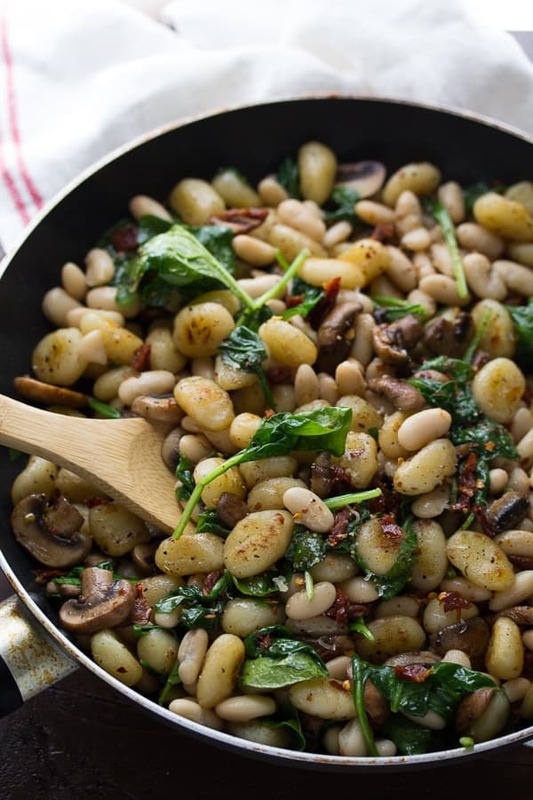 LOVE these 30 min Thursday recipes and I LOVE pan fried gnocchi!!! like, love like it. and this one is gorgeous! love and pinned! You too? I can’t wait for things to slow down…but for now I’m riding the crazy train 😉 Thanks, Alice! Oh my, it sounds like October is going to be a busy month for you! Quick and easy dinners are always such a lifesaver, this looks soooo delicious! Ha ha YES! I need lotsandlots of easy dinner recipes 🙂 Thanks, Danielle! I love it too, but pretty rarely make it….don’t know why! Thanks, Izzy! October is a busy month for you — hope you have a productive month on your thesis! I love pan-fried gnocchi so much, and you’ve added so many wonderful ingredients to it here. This is a 30-minute meal that I would devour! This looks like texture HEAVEN. 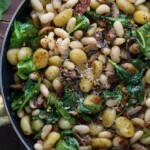 Love one pot recipes and this gnocchi dish looks wonderful. Love that you can make it for dinner and have the leftovers for lunch the next day. I’m with you on the finely minced sun-dried tomatoes – not a fan of the big chunks either. Ha ha! I just gave Ben a big lecture because the sundried tomatoes on our last pizza were ‘too big’. Poor guy 😉 Thanks, Geraldine! This has got to be my favorite recipe I’ve read today! Love the sundried tomatoes and how you pan fried the gnocchi- and that it’s all done in half an hour 🙂 Pinning! You are way too kind, Medha! It’s really SO easy! Girl, you are seriously super women. 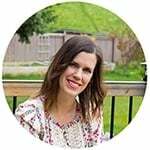 I would never have been able to write my thesis while blogging AND being a mom. You rock! And so does this gnocchi. Pan-fried gnocchi has been on my list of things to try. I gotta do it STAT! Aww thanks, Liz! I don’t feel like super woman, that’s for sure 😉 I am so glad to have things to distract me, to think about my thesis 24/7 would drive me insane. Thanks, Liz! I have never had gnocchi! Like never ever! But I did see some gluten free gnocchi at the grocery recently but I had no idea what to do with it…now I know! This looks amazing, and your photos are stunning!! Totally magazine worthy! 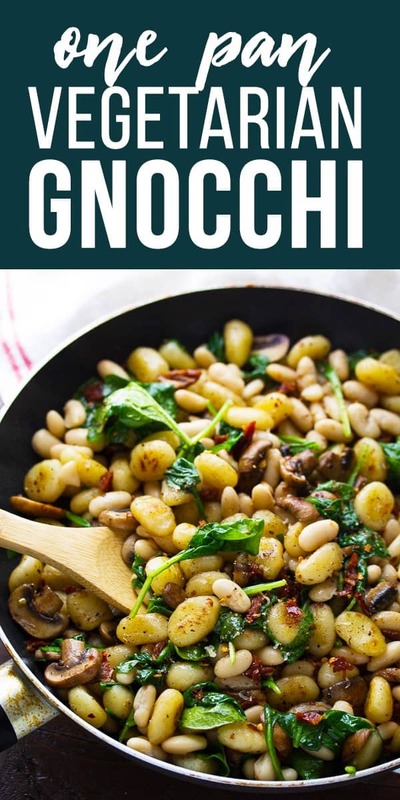 Oh my gosh, you need to RUN to the store ASAP and get yourself some gnocchi 😉 It’s so yummy, although I find the boiled gnocchi to be kind of…mushy? I like the pan-fried stuff much better 😀 And you are WAY to kind about my photography…thanks so much, Annie! Ha ha! Maybe gnocchi could be considered a tater tot substitute? Thanks so much, Sarah! This gnocchi looks AMAZING, Denise! You are reminding me that I haven’t had it in forever. What a perfect 30 minute meal! Thanks so much, Gayle! Gnocchi is the best!